Today, as more and more consumers turn to their smartphones to fulfil their shopping needs, the demand and the expectation for retailers to deliver increasingly sophisticated mobile experiences is rising. It’s no secret that US department store chain JCPenney has been a late-starter when it comes to offering its customers the digital experiences they have grown to expect. But that doesn’t mean that it’s too late to catch up. In fact, JCPenney has been overhauling the ecommerce side of its business, with mobile emerging as a new focus point for the retailer. Much of JCPenney’s struggles have stemmed from its reluctance to embrace omnichannel opportunities. That being said, Marvin Ellison, CEO at JCPenney, has highlighted that omnichannel one area in which the retailer has a long history of experience – albeit in a slightly different format than what’s expected today. He makes a valid point – but the question is, has JCPenney managed to draw on this experience, bring its omnichannel strategy up-to-date, and make it ready to serve the digitally-savvy shopper of 2017? Last year, the retailer made a decisive move towards modernization with a complete redesign of its mobile app that made shopping easier and more convenient for its customers. The new design focusses on a cleaner look, and delivers a streamlined checkout process with simplified product discovery features. JCPenney says that mobile has become the company’s “single greatest touchpoint with digitally-savvy shoppers,” making the app update a most welcome addition to its services. Many retailers often have trouble persuading their customers to download and engage with their apps due to often clunky functionality, particularly when it comes to filling out forms and entering payment information on smaller screens. But building a mobile presence is an especial concern for JCPenney, as its ability to attract younger shoppers could well be the key to reviving its business. "Since becoming CEO a year ago,” Ellison told RIS News in September, “the team and I have made considerable progress balancing the art and science of retail by improving our execution in omnichannel, marketing, store operations, supply chain and merchandising. There is still much work to do, but I am confident that our focus on sales growth, new technology and expense management will continue to accelerate our turnaround and create shareholder value." 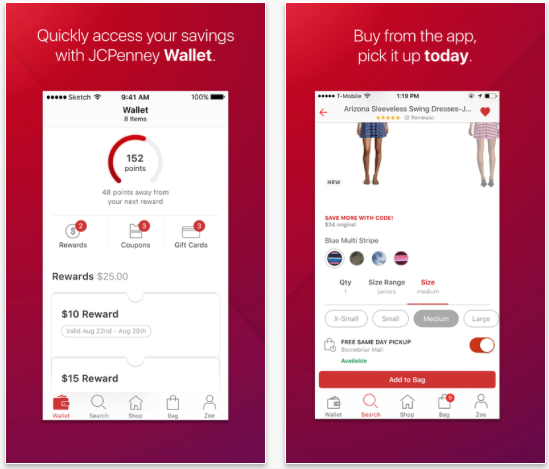 The new JCPenney app makes it much easier for shoppers to access their JCPenney Rewards, locate items, and apply coupons, which can either be used in-app or shown to an in-store representative to apply to a purchase. But there’s one feature in particular that’s been added that’s proving especially attractive to omnichannel shoppers – the Same Day Buy Online Pickup In-store option, previously only available on desktop. Users can now buy items directly from within the app and arrange to pick them up from their local store on the same day. Over 150,000 items are eligible for this same-day pickup service, usually within four hours of the order being placed. This is exactly the sort of omnichannel service that’s becoming a must-have for stores in today’s mobile world. And it’s great for sales, too – 40% of customers who visited a store to pick up an online order make additional purchases at JCPenney. "This app is far superior to our previous version and will allow us to take better advantage of the massive traffic growth in the mobile channel," said Ellison. "We know that mobile is the single greatest touch point for our customers in-store and online and the conversion of our app since launch has been outstanding." Faster home delivery is another option that’s being expanded upon in 2017. The company says it will soon offer a standard delivery turnaround of two business days or less, and will be available to over 95% of the US population. "Omnichannel is not a catchphrase at JCPenney. It is a strategic process,” Ellison says. “This process allows a 114-year-old retailer to leverage all of our assets, our stores, associates, our inventory, our digital platform and supply chain to reduce our costs, to serve our loyal and valued customer." JCPenney’s omnichannel fightback seems to be paying off. The retailer posted double-digit online sales growth for 2016 following the update of its app and pickup services, and the company plans to expand its online product assortment by more than 140% this year. While for many years JCPenney executives had been resistant to new technologies, the appointment of Ellison as CEO may have come just at the right time for the retailer. Here’s someone who understands the importance of ecommerce in today’s world, and that mobile will become an increasingly dominant force. Hear Lance Thornswood, Senior Director, Omnichannel at JCPenney, at his session How to Deliver Mobile Experiences that Exceed Customer Expectations at Mobile Shopping 2017 this October.